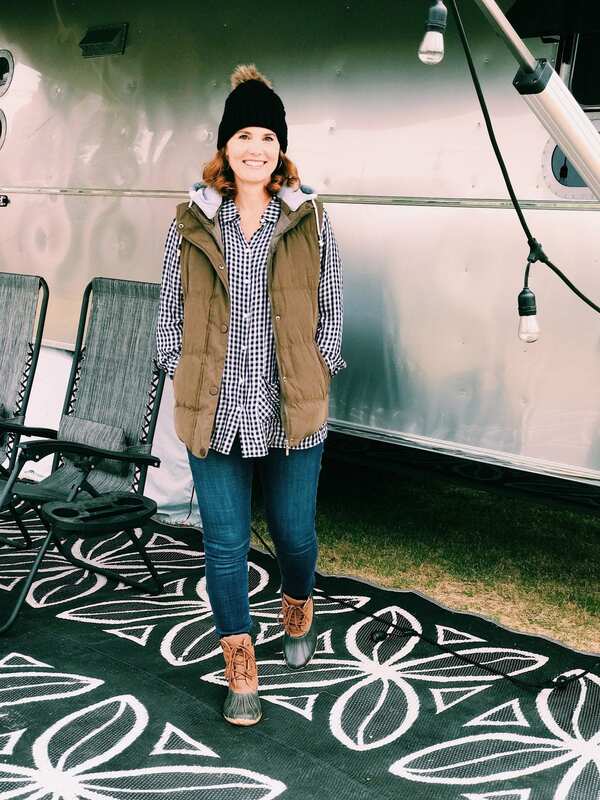 Inside: A puffer vest outfit for your cold weather camping. We’ve been traveling for five and a half months now and let me tell you, the weather we have encountered has been all over the place. We started off in Texas in May and June, which meant heat. Then we made our way north and had to break out the sweatshirts. Then we hit Oregon and Northern California in September and saw snow, with temps getting in the 20s. It’s been fun and a tad bit confusing wardrobe-wise, but I wouldn’t change a thing. We’ve decided to spend Thanksgiving in Arizona, as well as visit New Mexico and Utah. And then we’ll spend most of December in Colorado. So, it’ll be time to break out the puffer vest, coats, hats, and gloves for this Texas girl. If I could get by with wearing this puffer vest outfit every day, I would. 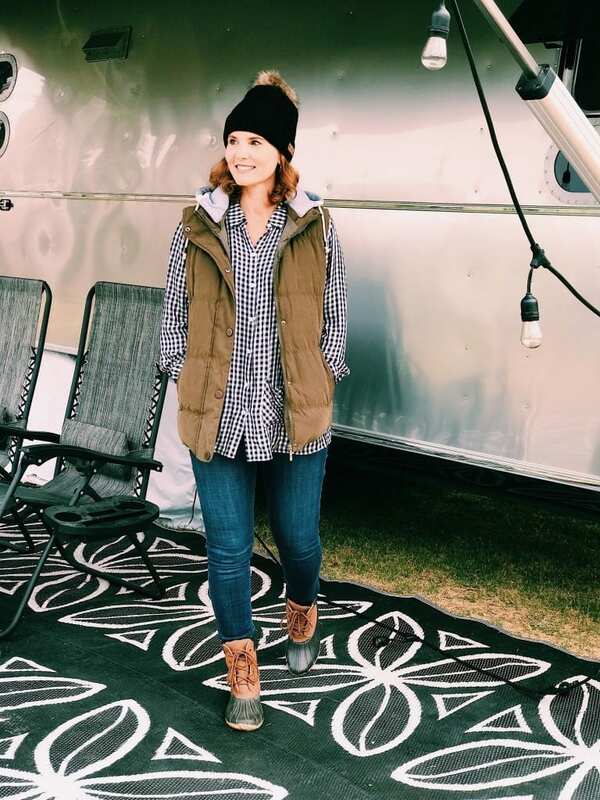 To me, it is the perfect outfit for chilling out by the campfire, cooking dinner on the fire pit or even for a short hike with the family. All I need is a pair of gloves (I have my eyes on these) and I’ll be ready for colder weather. When we planned our year-long trip, we initially thought we’d be back in Texas before we hit really cold weather. But we quickly realized we’ve been traveling way too fast and need to slow down a bit. Both for our sanity and to really see everything we want to see! Because of that, I left most of my winter clothes in storage, in Texas! Oops! 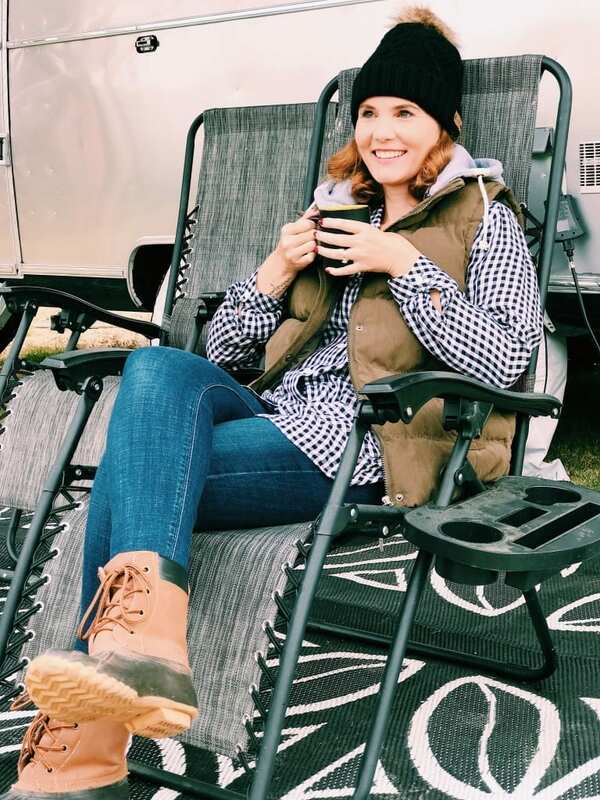 But one Amazon shopping trip later and I had this nice and thick olive green puffer vest and pom pom beanie waiting for me at a campground we were staying at. On a side note: How we get our mail is one of the most common questions we get in regards to traveling full-time. For everyday mail we used to get at our house, we use a mail service. They receive our mail, scan it, email us and then we tell them what to send and where. For packages, most campgrounds allow you to receive mail. For the ones that don’t, we just have our mail delivered to the town’s general delivery address and pick it up at their post office. This puffer vest is very thick and comes with a detachable hood. The pockets are super thick, which help keep your hands nice and warm. It comes in five different colors and is machine washable, but you’ll need to lay it out to dry instead of throwing it in the dryer. I am so pleased with the beanies I ordered. They came in a 2-pack: one black, and one white. The company has these beanies in so many different colors, both in single and double packs, you’ll easily find one you love. 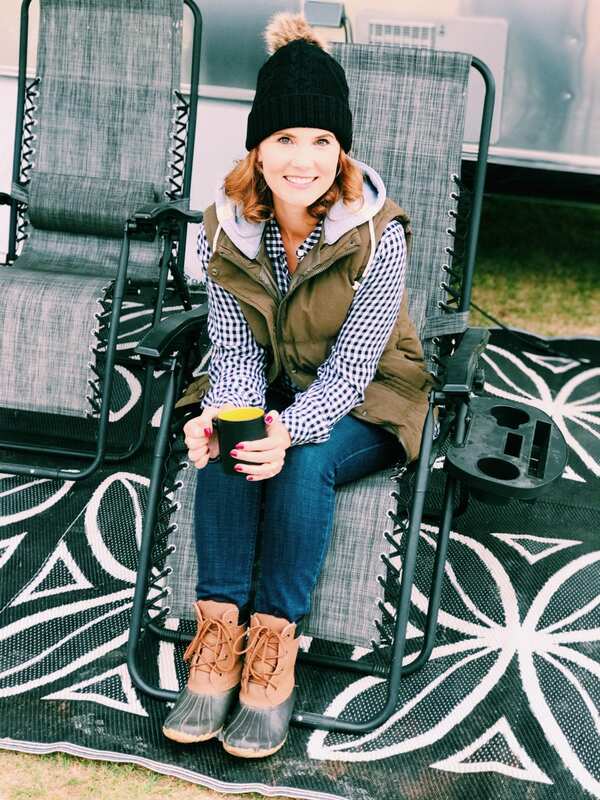 The faux fur pom pom adds a fun element to the hat and the fleece lining helps keep you extra warm. When my ears, hands, and feet are warm, I’m a happy camper. Do you and your family go on any winter camping trips? 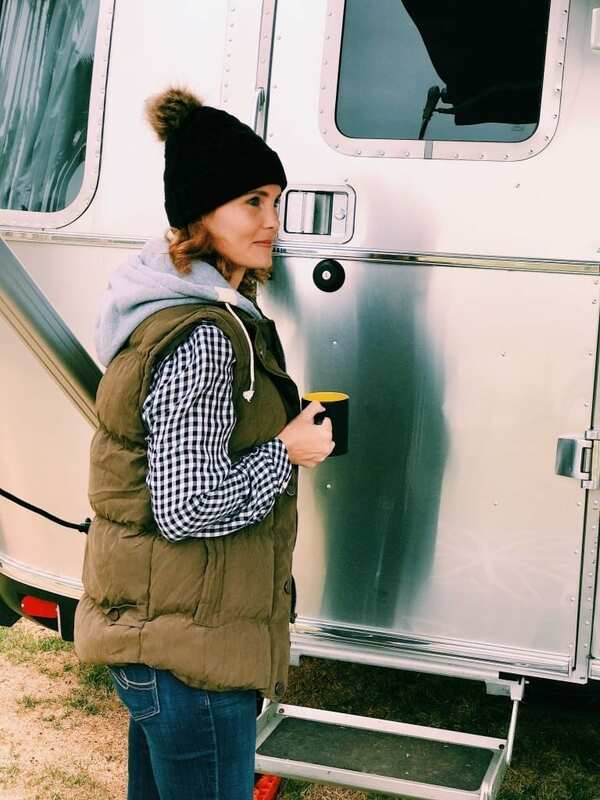 It’ll be both fun and interesting to experience the Colorado winter from an RV. Wish us luck! Puffer vests are so warm! Love your pics – it looks like it was a really fun trip! That vest is darling. I love vests because you can always change up the look with different undershirts, scarves, etc. So cute! Yes! They’re so versatile. Thanks for stopping by Marlynn! I love a good puffer vest myself! Yours is too cute. OMG this vest is so cute! Love the whole look, from the beanie to the duck shoes. Super cute! This is such a cute look for outdoors! I love olive green and gingham paired together!